The barn project has been busy for the past week. 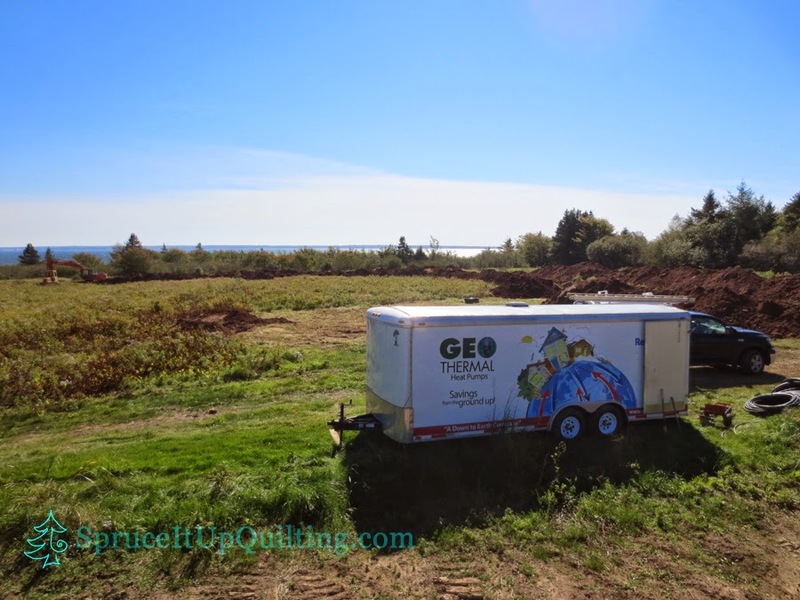 Geothermal heating system is new to us and so is the preparation for both the barn and the house/cottage. 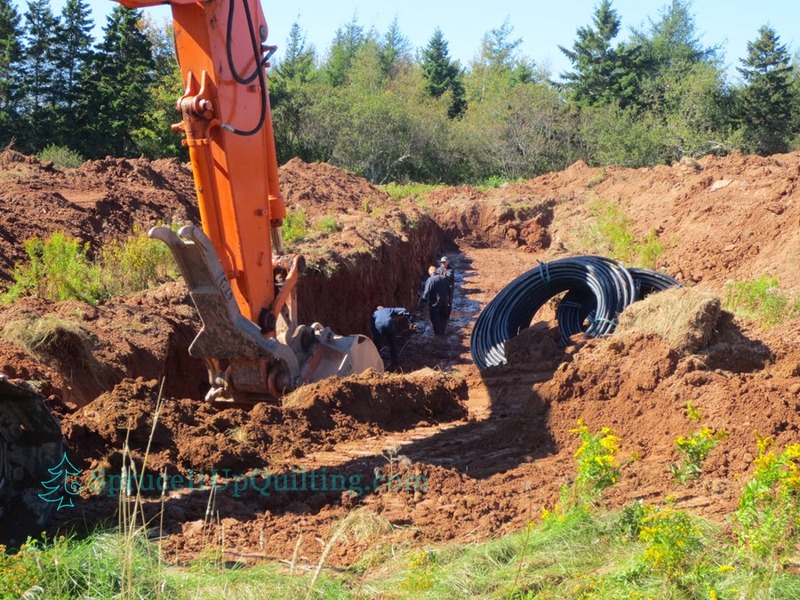 We did plan to install the in-ground tubing for both buildings this fall... weather-wise, we couldn't have chosen a better week even after a few delays! 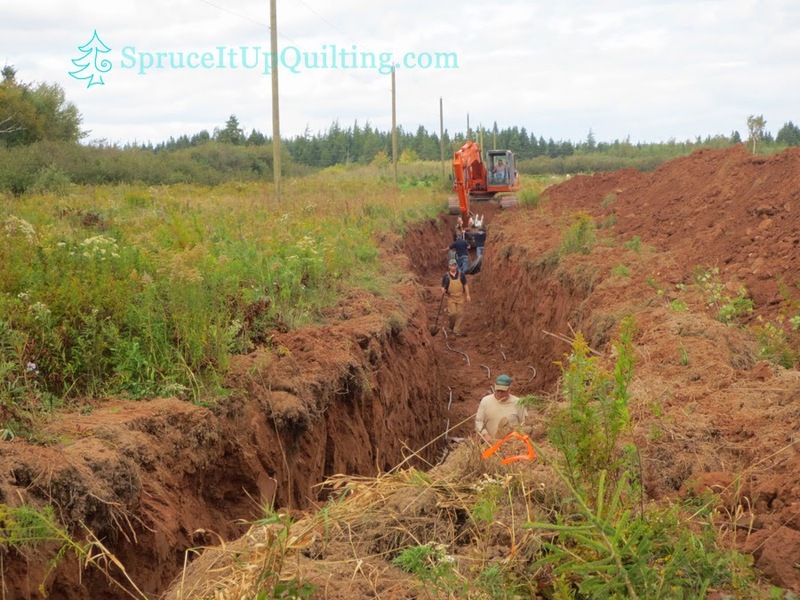 While the connections were pressure tested (an overnight test), digging for the cottage tubing layout was started... as you can see, it's a much longer L-shaped trench is needed. 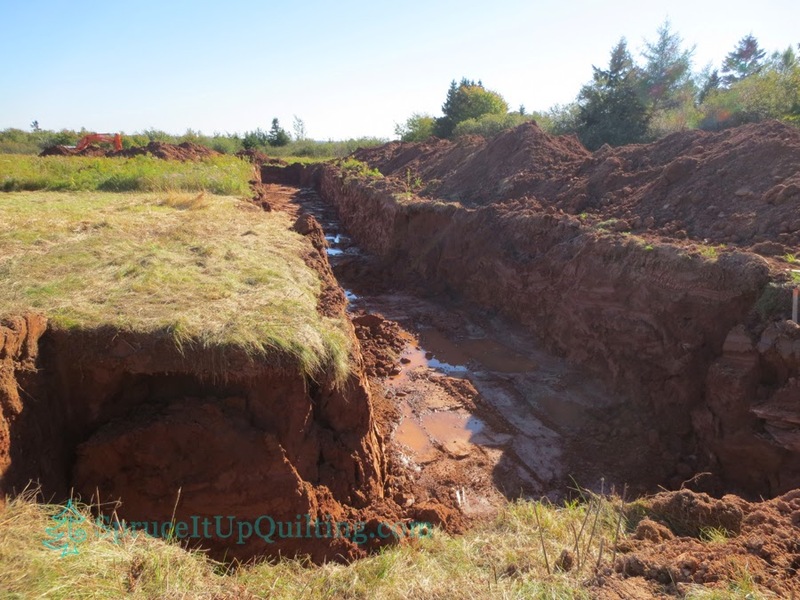 It's all done now and the tubing is sticking out of the ground ready to connect to the buildings. 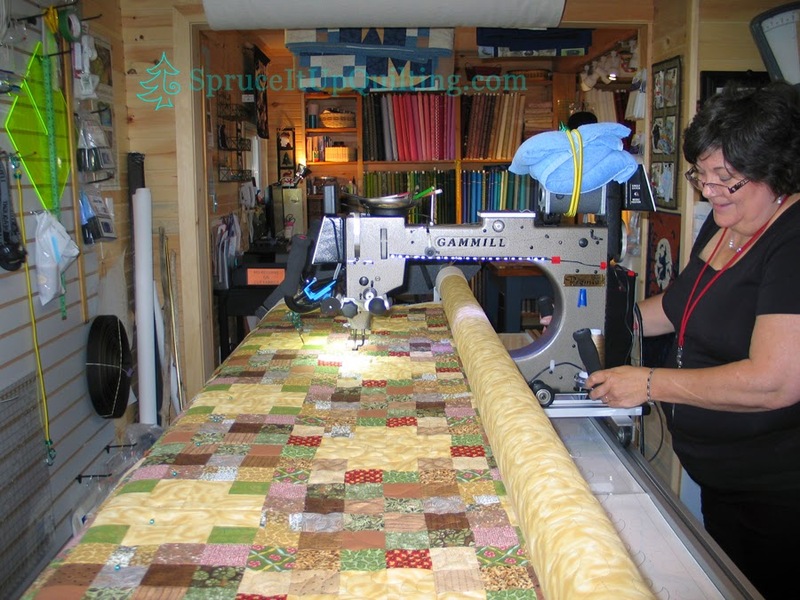 Meanwhile, Lolah had a visitor last week... Odette was here to quilt her beautiful fall colors queen-sized quilt. 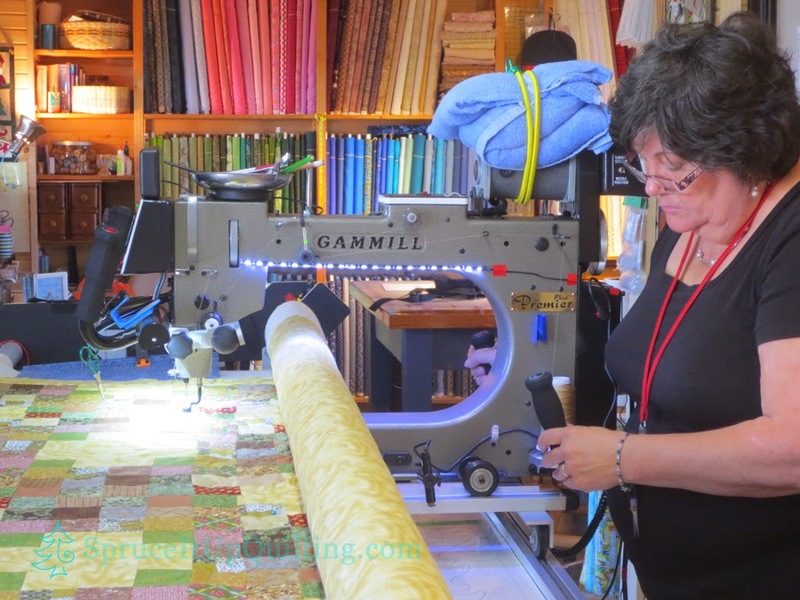 She chose King Tut Shifting Sands thread which is a beautiful pale mixture of colors matching her top fabrics. 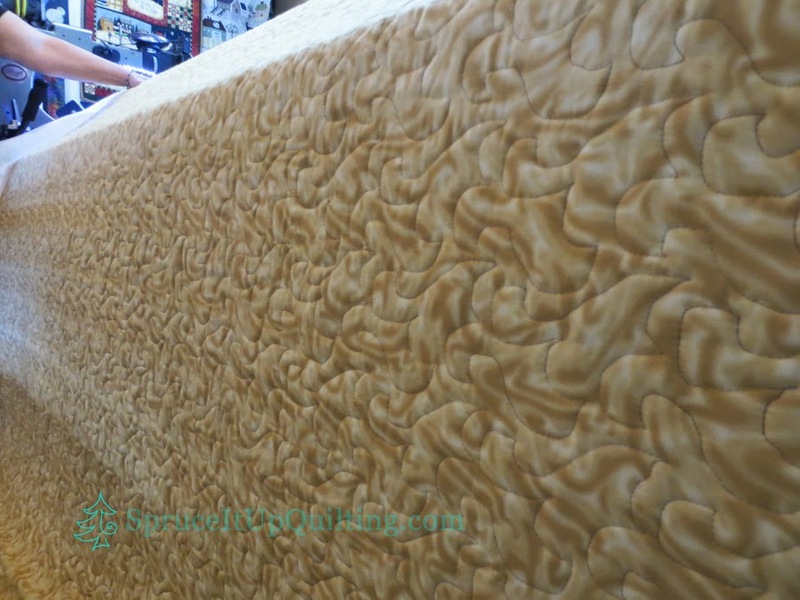 It also blended very well with her backing. 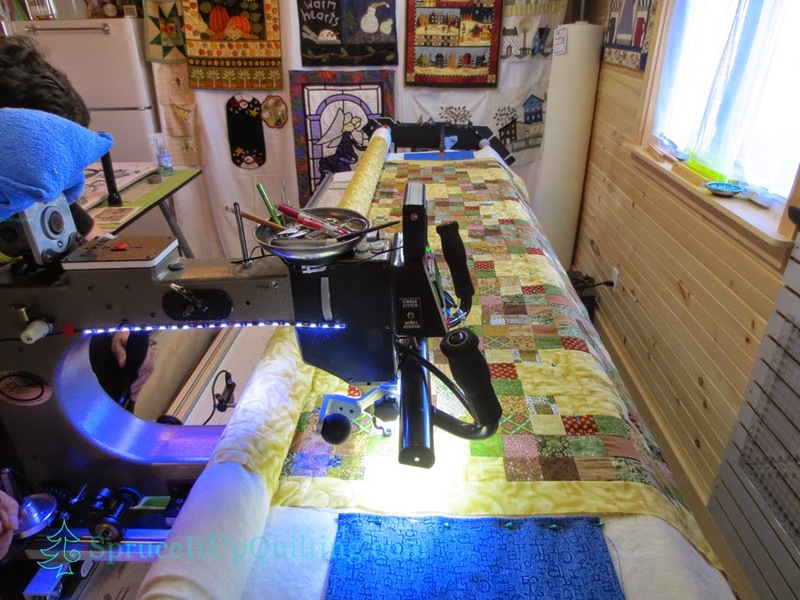 A word to those who send their quilts to longarmers or who come to quilt on Lolah: Please make sure your backing is at least 3 to 4 inches wider and longer on each side. 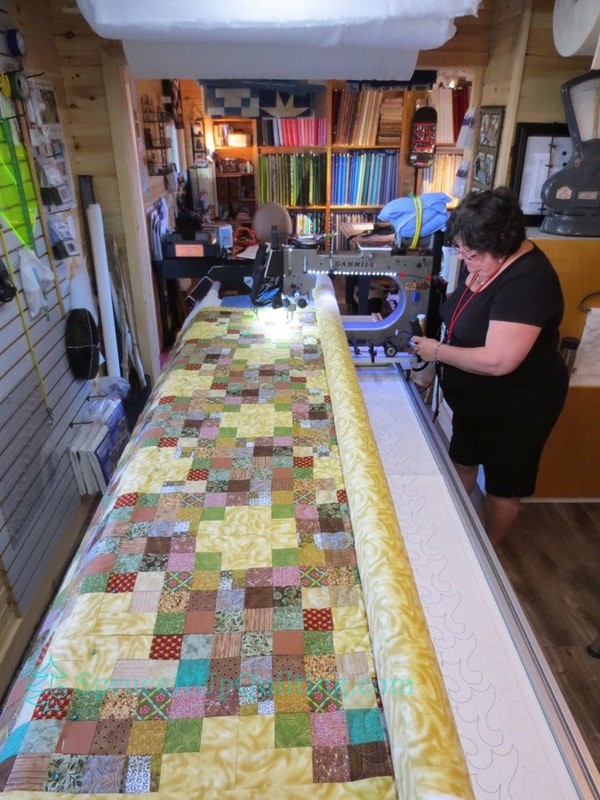 Odette's backing was just a wee bit wider and longer and we made it work but it's easier to quilt when there is more than a little extra width. 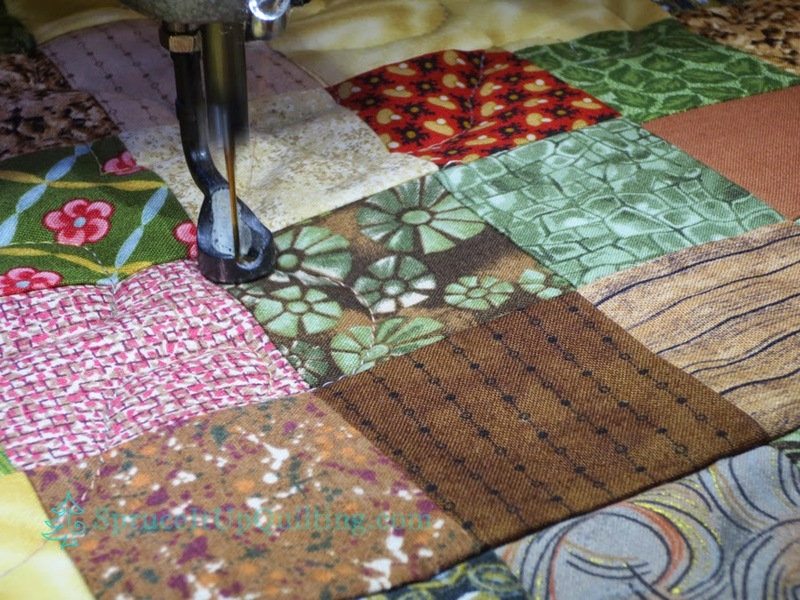 Such a beautiful scrappy quilt!! I wish I had some of these fabrics... the brown with the dashes and circles, the greens above and to the right... and so on and so on... the beige next to the brown looks like wood planks... so useful for a house quilt! 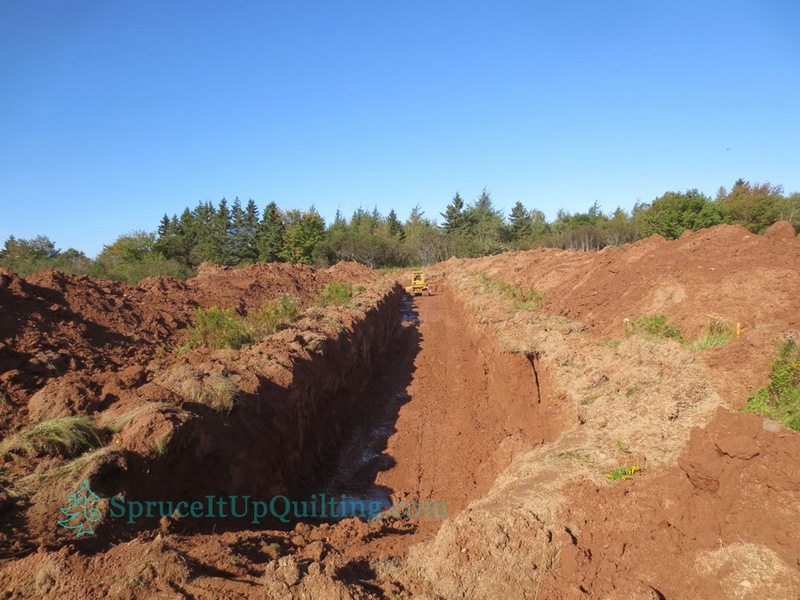 Odette enjoyed her day; she took it slow and steady, not rushed and the result was amazing. Sadly, the photos we took of the finished quilt disappeared when I downloaded newer photos... word to the wise: when your computer asks you if you want to save a new version of a photo that already exist in your folder, reply yes to all! I chose no and it rendered them unreadable. I've replaced the memory card in the camera with a new one while awaiting my guru who can recover them without having to purchase software. I will eventually have those photos to show you... just not today! So sorry Odette!!! 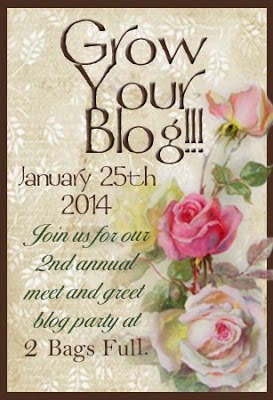 Perhaps you'll have a photo that I can share before you give this wedding gift away? 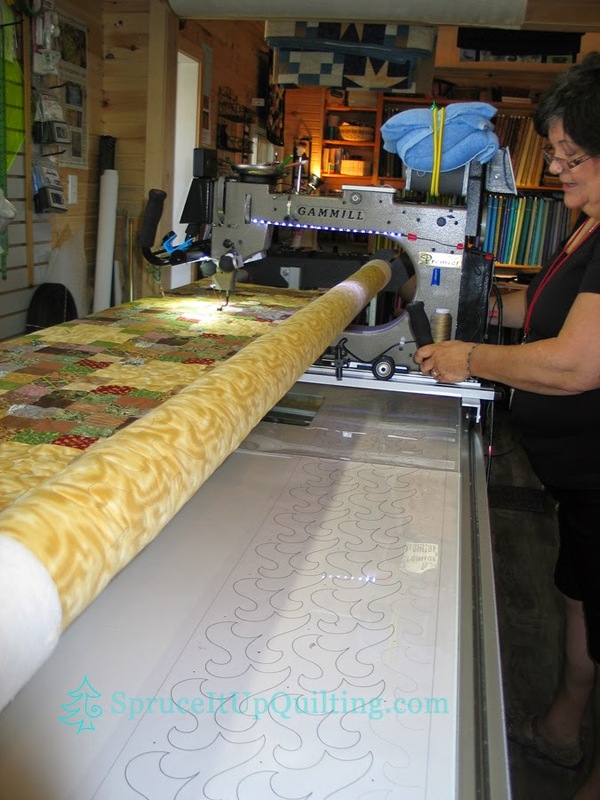 Spruce It Up Quilting has new backings in stock! You'll love this new line and the awesome colors!! Also back in stock are the Perfect Scissors, new colors of Kimono silk thread, zippers by the yard in white, and Perfect Thread Bags! 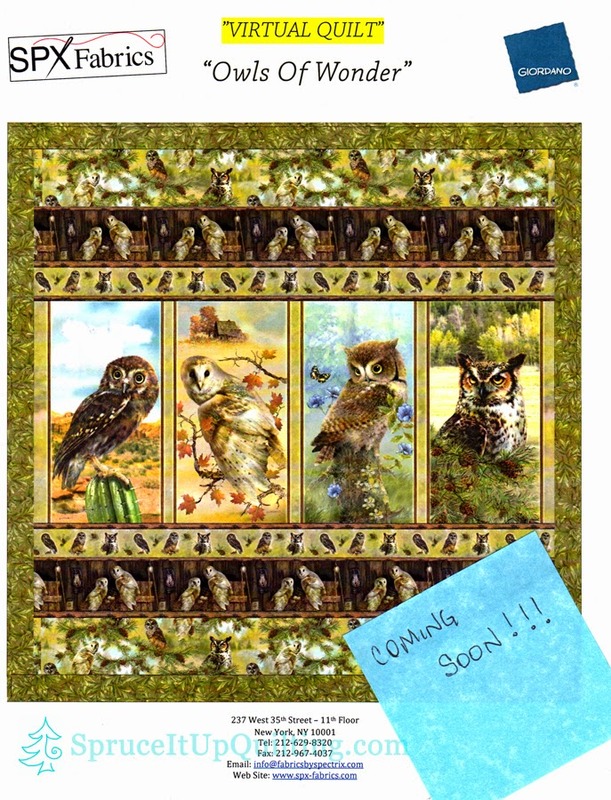 Coming soon is this beautiful owl fabric... watch for it... the images are beautiful! 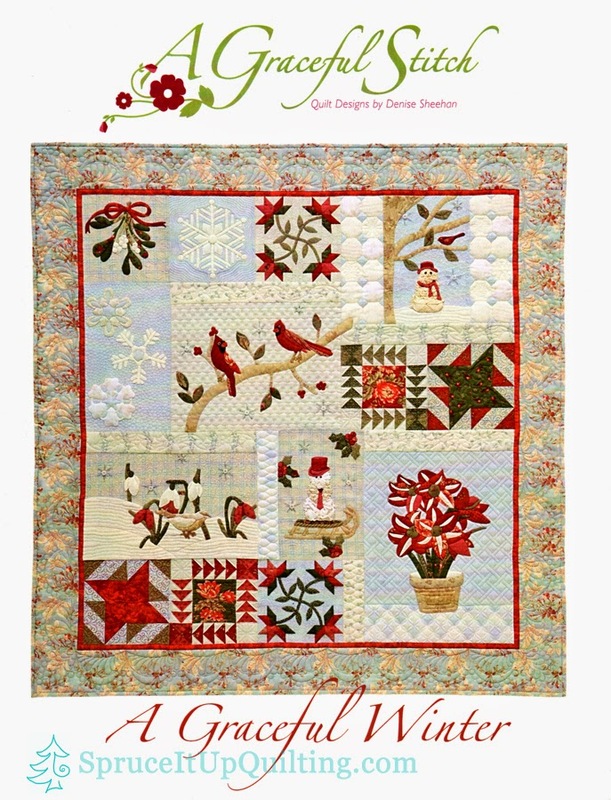 Finally, you won't want to miss this new 2015 Block of the Month... it's a gorgeous pieced and appliqué design by Denise Sheehan, from her seasons collection. Starting January, it will run for 11 months! Price to be determined but you'll want to join soon since spaces are limited. Come meet Madelaine on Monday... she'll be in charge for 10 days!! Lolah and Lorette need a rest!! My sister and I very much enjoyed our visit to you shop yesterday. You are well organized and helpful. Thank you! It was a pleasure to meet you and I thoroughly enjoyed your visit! Come again soon! This is a great inspiring article.I am pretty much pleased with your good work.You put really very helpful information. 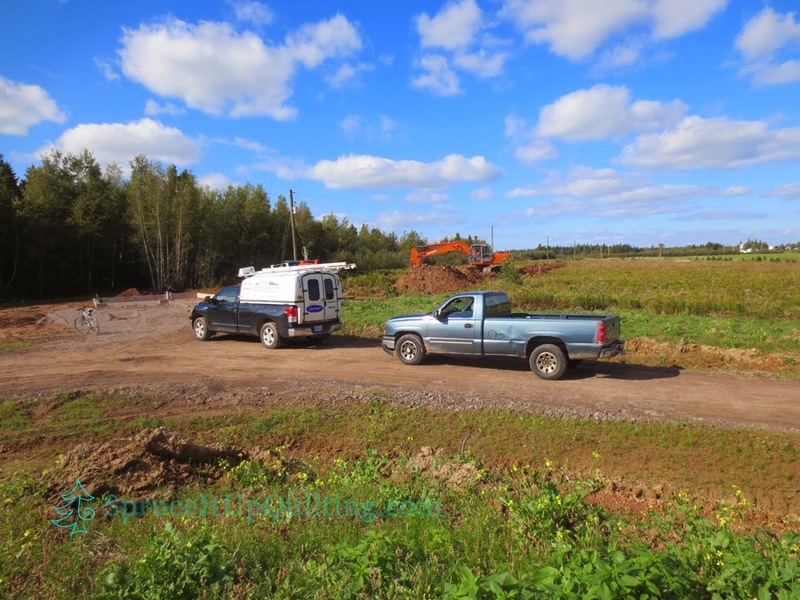 Keep it up.if you looking for a good directional boring contractor then check it now.